Pissaladiere or Pissaladina is a type of white pizza that originated in Southern France and was believed to have introduced by the Roman cooks during the Avignon Papacy in the 1300’s. A very unique pizza where traditional methods suggests no tomatoes and cheese in the ingredients, instead sautéed onions (cooked until soft), olives, garlic and anchovies are used. Mozzarella cheese is also seldomly used but in sometimes used in the Italian but never in France. The term came from the French word “pissalat” which means salted fish. A very different pizza type where flavours are intense attributed by the anchovy and anchovy oils used that why modern versions serve it now as an appetizer but still can be enjoyed as a mains if you wish. Not sure if this will appeal everyone as I know anchovies are a turn off to a lot of people, even I don’t like it before but I learned to enjoy the taste later on as anchovies are widely used in the Philippine cuisine, how about you do you like anchovies? Mix yeast and 1 tsp sugar on warm water, set aside until very bubbly. Now combine the rest of the ingredients for the crust but using only 1 1/2 cup of flour with the yeast mixture. Mix with a spatula until it forms a batter. Now place it in a big greased bowl and cover it with a cling wrap, make sure it will handle twice the size of the dough. Place in a warm location (I usually place it in an oven preheated to 60C then turned off) for around 45 minutes or until it doubled the size. Once doubled, remove from container, deflate and continue to knead, flatten using a rolling-pin make sure the thickness is no greater than 5mm, place it in a well-greased pan, brush with oil and dust with corn meal. Heat oil in a pan over medium-low heat then add onions, salt, pepper, bouquet garni. Slowly simmer while stirring occasionally for 1 hour or until it reach a very thick consistency (like jam) and liquid has evaporated. Remove from heat, remove bouquet garni then set aside. Place your toppings placing the onion mixture initially, then top with cheese and finally with anchovies. Let it rest for 15 minutes. Place in a preheated over at 230C for 20 to 25 minutes. Another great version of pizza Raymund, nice and lovely color on top but I am not a pizza person, my rice is my savior. Your beautiful pissaladière reminds me i haven’t made it for ages! I make mine without any cheese, with olives and it’s so addictive, I am happy to have several people to share it, otherwise I finish it on my own. Your idea to add mozzarella places it somehow between a pizza and a pissaladière. I love it. Anchovies are great and even those who hate them when served whole, love the sauces with the melted/mixed anchovies addition. They make everything taste more complex, a bit like the Thai/Vietnamese fish sauce. i haven’t tried white pizza eat.. i somehow find it weird for a pizza not to have tomatoes and cheese. Pizza? Yes, anytime, any kind (well, just about). Looks marvelous. This is my kind of pizza. As much as I love meat, I don’t like it on pizzas. This is just stunning. I’ve never heard of this before but I’d love to try it! I’m sure it’s wonderful! I’m not sure if I like anchovies or not, but I like sardines, so I probably would? 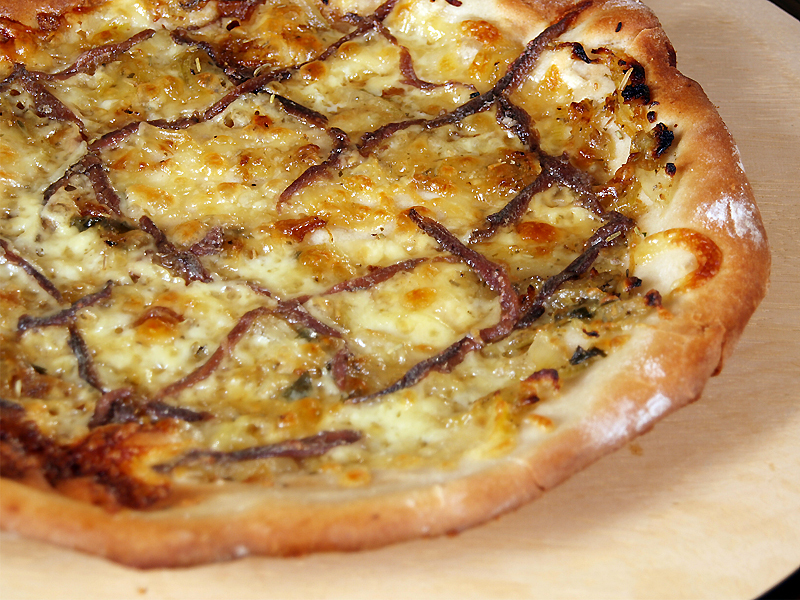 Your pissaladière looks delicious with melted mozzarella cheese! A very interesting twist to the original! I too have written a small article about the origins of the pissaladière should you like to have a look.